‘Health is not simply the absence of disease’ is the philosophy on which the brand Navarasas bases its products. Holistic medicine is the concept of treating the whole person or animal rather than just parts. 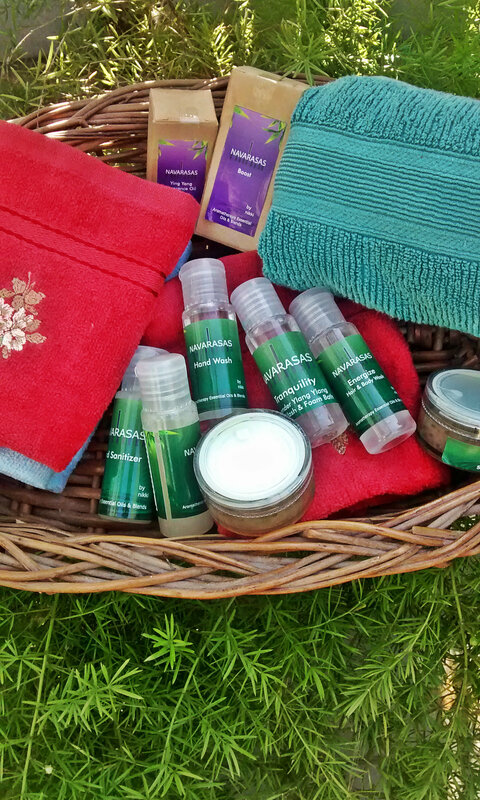 Harmonizing holistic healing & nature’s living energy in the form of Essential Oil blends & Aromatherapy, at Navarasas they cater to a wide range of all natural products for humans & animals alike. To keep the interaction pure, they don’t use any chemicals or additives.Their mission at Navarasas is to bring about eternal wellness & balance of mind, body & soul! While my mission was to test these products and give an honest feedback, and that is what I have done. I know it is a strange product to begin with, but that is because being obsessed with Hand Sanitizers, this one i am addicted to. Unlike most Hand Sanitizer’s, this one does not smell like an antiseptic cream while having all the essential antiseptic properties and genuinely makes your palm smooth. This scrub has excellent cleansing qualities and the essential oil leaves the skin feeling replenished and a glow on the face. Though the salt makes it slightly itchy if you have broken or dry skin, so you need to be careful for even despite the essential oils for it may pinch slightly. A very relaxing product, this is excellent for a soak in the bath after work. Inspired by the tranquil properties of lavender and Ylang Ylang it is bound to relax you and make you feel stress free. But it is better used as a foam bath than Body wash. The tree and lemon Hand wash same as the Hand Sanitizer shows excellent results in terms of hand care. Crafted with all-natural germicide properties of tea tree and lemon oil it is a definite must buy! Packed with essential oils, this shampoo is supposed to be excellent for damaged hair and dandruff. It did have a good result on my hair texture, but I felt the consistency was too watery and too much product got wasted. Maybe after being used to soaps which lather a lot this was a bit different, but I would need more than one wash to be able to judge properly. Posted on October 7, 2014 by AparnaPosted in Beauty, ProductsTagged Aromatherapy, beauty, Essential Oils, Holistic, India, Lavender, Lifestyle, spa, Therapy, Ylang Ylang. AWESOME PRODUCTS BY MY AWESOME FRIEND NIKKI! KEEP UP THE GLORIOUS WORK NIKKI..